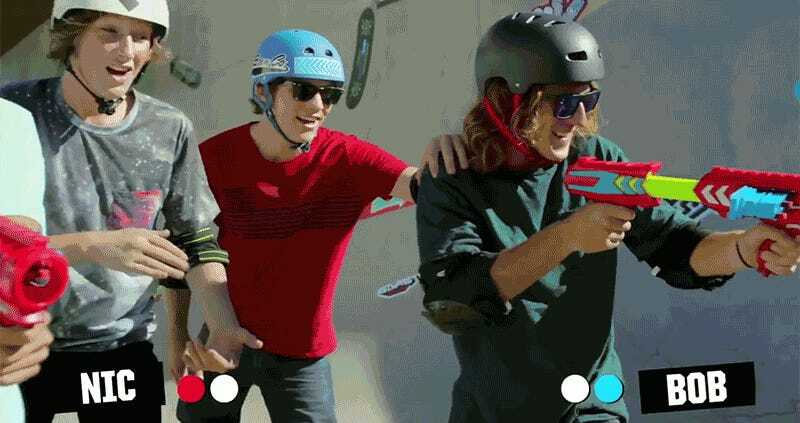 They haven’t officially been announced by Mattel just yet, but a promotional video on YouTube reveals a new addition to the BOOMco dart blaster line in the form of springy targets that can be clamped to moving or stationary objects. If you listen closely, you can hear your co-workers cheering. Because the BOOMco darts feature special tips that allow them to stick to the brand’s Smart Stick targets (which turn out to be just regular photo paper) trying to hit a target becomes more interesting because you know without a doubt when you have. The non-stick darts used in other brands’ blasters just bounce off surfaces making it impossible to know the exact spot where they made impact. BOOMco’s Action Grip Targets feature a clamp so they can be easily mounted anywhere. And that’s actually an improvement over the Smart Stick paper targets which rely on adhesive backings you rarely want to stick anywhere. (Say goodbye to the paint on your walls.) The spring neck also helps the new targets keep moving on their own—without batteries—which increases the challenge.